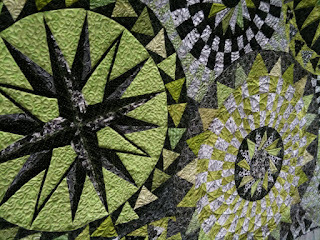 Busy sewing... lots to catch up on to post! Here are a sample of the squares I received from the Red and Aqua Swap. Received last Nov.
And a playmat for my baby niece. Lots of pics saved up! Will post more soon! Yesterday was a Halloween celebration at work. Pumpkin carving contest for the employees in the morning and a party for the families in the afternoon. 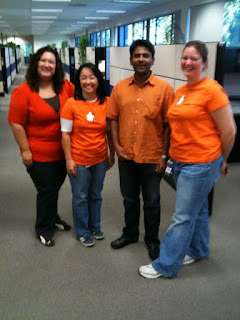 Here I am with Andrea, Rondi and my boss. A fun but busy day. On the health front, I ended up going to an Urgent Care facility after leaving work and have been diagnosed with a sinus infection. No wonder this darn headcold wasn't going away! I think this is the first time I've had a sinus infection and I've got a huge headache, along with pain in the nerves on the top molars, so much that I can't eat anything hard. It's crazy! Here's hoping the antibiotics kick in soon!!! So K let's me know on Sunday that he needs to be a Native American for his role in the Haunted House at school... Does he think I can just pull this stuff out of my sewing basket? The first idea was to just go with a brown t-shirt and embellish it with fringe, but then I started looking at costume ideas online, went to the fabric store, and just decided I would make the darn thing. It would look so much better and maybe he would get some use out of it in the future. And I was kinda happy to be able to make him a costume again - I think the last one was some Star Wars outfit about three years ago. So here's what I came up with in two nights. He'll wear tan jeans for the pants. All that fringe cutting took forever! But it was all in the name of good crafting... and for my little boy. Hopefully, I can get a picture of him in full regalia as he will be working at the Haunted House for the next three nights. 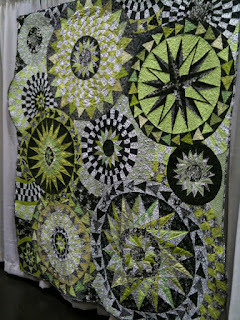 A little project I just finished with scraps from my Split Pea Soup quilt. It has now been one week since this headcold came on. Bleh. I guess I feel lucky that it has only stayed in my head instead of meandering down into my chest/body. I am now at the point where it needs to be gone. I haven't been able to taste food for the past couple of days, but then again I haven't had much of an appetite. Work hasn't been crazy, but enough needing to be taken care of that I have come in for a few hours every day. This was truly a marathon weekend (ok, well, it was two weekends ago)! I got to spend two very long days with a few of my dear friends. 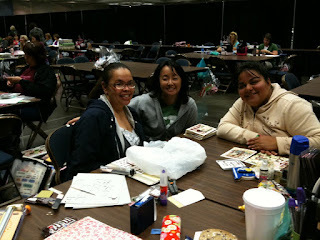 Saturday was the Sacramento Scrapbook Expo at the Sacramento Convention Center. Rocio and I headed up to meet up with Rhonda to do some shopping and cropping, and catching up. We left Rocio's house at around 12noon and got back around 1:30a. I can't say I got very much completed at the crop, but I was mostly there to hang-out with my girls anyway. The cruise up in Rocio's brother's lowrider truck and the 'OMG, it's not Sunday, it's Saturday and we didn't feed the parking meter' excitement made for a terrific day! Thanks for driving, Rocio, and sorry I fell asleep on the way home!!! 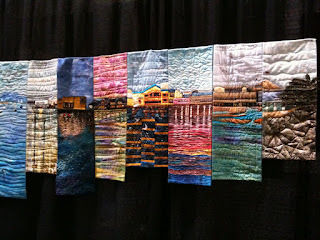 On Sunday, Debbie and I headed to the Pacific International Quilt Festival at the Santa Clara Convention Center. Wow. 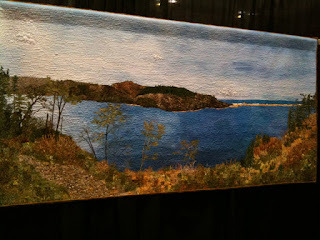 We attended our first quilt/sewing expo a couple of months ago and were pleased, but O.M.G. this was incredible! Not only was the sheer floor space of the entire event humongous, but the level of artistry that these artists achieve was nothing short of mind-blowing. These pictures don't do the works justice, but it is just a sample of what we saw. This one was a group effort where each panel was done by a different member. The only constant needed to be the horizon line. The detail work in each of these is something that needs to be seen in person to be truly appreciated. 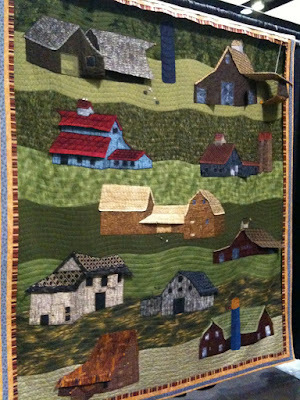 An overall show prize winner. It was based on a photo that the artist's daughter took from her apartment window in Hong Kong. A study on perspectives. Check-out the 3-D work. Nearly all of the roofs had 3-D pieces to them. Clearly not one for the top of a bed! And then to bring it home. Another group effort. Amazing! 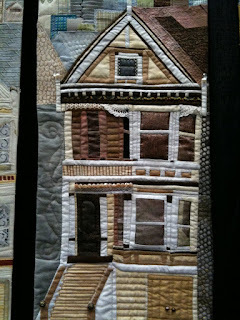 With my love of victorian houses, I was floored with this one. Six and a half hours there and we were spent. So many incredible works, but there was a point where we just couldn't focus on each individual one anymore! 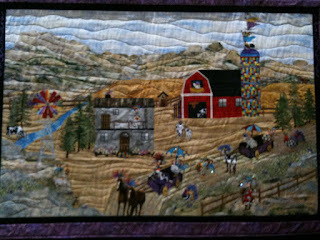 Debbie and I was both very inspired to see sewing at this level. 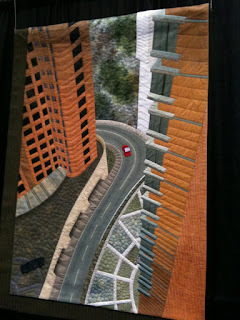 I think Debbie may be brushing that dust off of her sewing machine very soon! 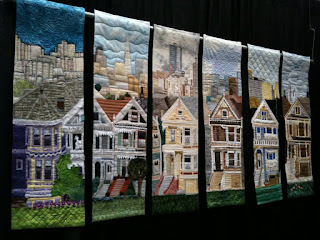 I've already signed up for two classes at a local quilt shop since I've only quilted by-the-books. 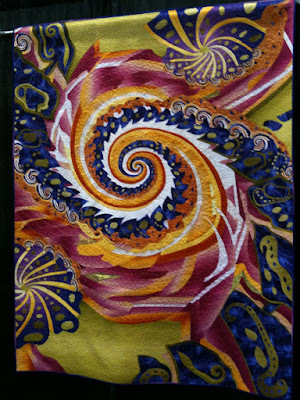 I'm excited to learn more about the art of quilting and see what I can create myself! It was a terrific weekend and I loved having the opportunities to spend time with my friends! I could have done without the headcold that came on on Monday night following, though!! I don't know what I was thinking. I agreed to do ANOTHER ride event only two weeks after the last one. Ok, I was feeling really strong after the Lighthouse ride, but given the circumstances of having skipped riding last weekend because I thought I was coming down with something... not a good idea. Thanks goodness we ended up deciding to take it easy and only do the 40 miler. At the top of one of the hill climbs. 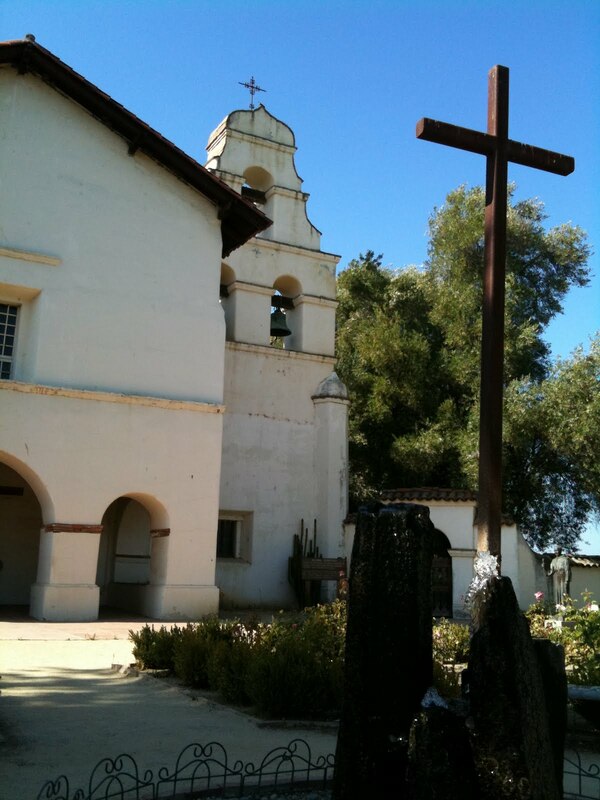 And the mission itself, San Juan Bautista is always beautiful. But, it is probably not a ride I would do again because the roads were crazy bad from farming vehicles and trucks constantly driving over them, and the headwinds that kicked up on the return ride out in the vastness of the flat farmlands were brutal. Well, they were for me - J didn't seem to think so, ummm, whatever. And we had to park in a field with dirt clods and hay and trop through it pushing our bikes - thank goodness we have cleat covers! Cubicle dweller by necessity, OCD crafter by choice. 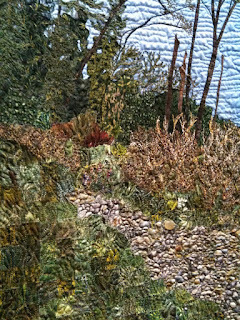 My creative mojo comes and goes and which project I'll choose depends on the mood, but when I get going - watch out!